Sign up here to receive info on new products and more via email! Polypropylene plastic erlenmeyer flasks are an excellent alternative to glass flasks due to their durability, chemical resistance, and autoclave compatibility up to 121° C. These chemistry lab flasks are available in five sizes ranging from 50 ml to 1000 ml and are available in three different styles. The graduated flasks feature a conical shape that allows the contents to be mixed or swirled during experiments, as well as a narrow neck that helps prevent spilling and slows evaporation. Numerical graduations are permanently molded into the sides of the conical flasks. Lab flasks with plastic stoppers include graduations and temperature constraints printed on the side. These polypropylene flasks are heavy walled and feature a tooled neck, which is designed for an accurate stopper fit. Flask stoppers should always be removed when autoclaving to prevent accidental implosion. Polypropylene erlenmeyer flasks with plastic screw caps feature a wide mouth for easy pouring, as well as printed graduations and temperature limitations. These plastic flasks can also be used with plastic stoppers. Polycarbonate plastic erlenmeyer flasks are made of virtually unbreakable Lexan polycarbonate, which is autoclavable, certified non pyrogenic, and DNase/RNase free. These biology lab flasks are available in sizes ranging from 125 ml to 2000 ml. Each size can be purchased with or without baffles, which help to regulate the flow of liquid inside the flask. The optional baffled flasks come sterile via gamma radiation and are packaged individually with both a standard leak proof closure and a vented closure for sterile air exchange. These plastic flasks fit all standard shaking incubator stamps and are ideal for cultures, media preparation, storage, and more. Polypropylene plastic volumetric flasks are available with either plastic screw caps or plastic stoppers. Both style laboratory flasks are molded to class B tolerance and feature a mixing chamber and a tooled neck. Sizes range from 25 ml to 1000 ml for plastic lab flasks with flask caps, or 25 ml to 500 ml for flasks with flask stoppers. Each polypropylene flask is individually calibrated and autoclave compatible with temperature restrictions printed on the sides. PMP plastic volumetric flasks are made of transparent polymethylpentene and are available with screw caps. These lab flasks feature class B individually calibrated ring markings, are available in sizes ranging from 25 ml to 1000 ml, and are autoclavable up to 180° C.
PFA plastic volumetric flasks are ideal for ICP-MS, production, and storage of trace analysis standards, isotope separations, and sample digestions. 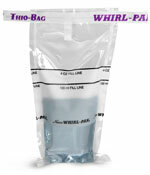 The PFA flasks feature high translucency and include plastic screw caps with sealing rings, which are leak proof, provide a hermetic seal, and protect against outside contamination. Similar to the polymethylpentene plastic flasks, they feature class B individually calibrated ring markings. These lab flasks are available in a range of sizes from 25 ml to 500 ml and can withstand temperatures up to 270° C. The plastic flasks can be autoclaved at 121° C without affecting tolerances and can be sterilized by dry heat, gamma radiation, gas, or chemical disinfectant. In addition to the plastic lab flasks SKS offers, be sure to fulfill all of your lab equipment and flask accessory needs with products like our MyTemp Mini digital incubator, automatic titration burettes, and clear glass trypsinization flasks. Newsletter compiled by SKS Science Products. Your comments are welcomed, please contact us. All or any part of this newsletter cannot be reproduced without the consent of SKS Science Products * SKS does not imply that the goods depicted are fit for any particular purpose. See terms and conditions.